The vile prince of the night and his foul kindred seek dominion over the world! Only a handful of brave and stalwart heroes stand in their way. 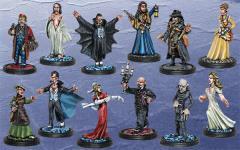 Vampires battle stake-wielding hunters in the grand tradition of Victorian horror. This set comes with a one-sheet introductory rule set. White metal figures are supplied unpainted.